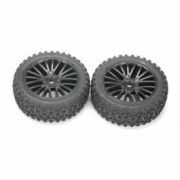 These are DHK Front Tires Mounted for the Wolf Buggy (8131-013). Includes one pair. Works on both the brushed and brushless versions of the DHK Wolf.